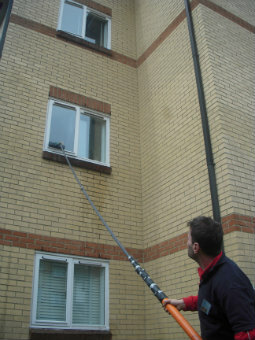 A: We can promptly remove smudges with either external window cleaning (for four-storey properties), rope access window washing (for high-rise properties), or via the well-known manual cleaning of interior windows. Q: Can you explain me a bit more about your water-fed rod cleaning method? A: Certainly! This cleaning tool can extend up to 22 metres in length, allowing the team to easily reach and wash even the farthest corners of your glass surfaces. A: Our water is purified from any residue-causing minerals. When this water disappears under the sun, it won't leave any splodges behind. Q: Will you conduct your service in a cloudy weather? A: Rainwater is usually dirt-free, so it won't halt us from doing our job. However, while we won't mind a slight shower, a sudden rainstorm can lead to unsatisfying results. During thunderstorms, we may have to delay our service for a day of your convenience to ensure the cleaners' safety. A: No, the seasoned window cleaners in Croham can easily perform outer window cleaning without you being around, as long as your property gates are unlatched. And if you want your panes to sparkle on the inside, just schedule our complimentary key pick-up and delivery option instead. A: Yes – we will rinse your PVC or UPVC frames and sills at no extra cost! With our window cleaning in Croham, you get a quality rinse of your sash windows, skylights, conservatory roofs, French doors, and other glass surfaces at budget fees. We will even offer a free of charge treatment of all PVC & UPVC frames and sills! For a full list of our prices, please view our price table below. With window cleaning in Croham, you can quickly remove long-forgotten stains from any commercial or residential property. Keep scrolling to find out how. To rinse your windows' outside facet, the practiced window cleaners in Croham will use the latest cleaning equipment – a water-fed pole that runs on purified water. The cleaning tool's significant reach (22 metres) allows the adepts to chase away dirty spots from any four-storey premises without using ladders or unpleasant washing solutions. To tackle stains on high premises, we've come up with a wholly different cleaning procedure – the rope access window cleaning. After estimating your property's dimensions and location, a team of dependable climbers will either use ropes or ladders and squeegees to restore the former glory of your casements. We always organise each session in advance to avoid mishaps and can provide you all the necessary COSHH documentation upon request. To refresh windows on the inside, the adepts may have to carry sponges and ladders to reach hard-to-get places. In our aim to aid as many Londoners as we can manage, we've expanded our window cleaning in Croham to encompass extra locations across London. For your comfort, we've mentioned the names of these neighbouring locations below. For those of you who'd rather book window cleaning services Croham CR0 online, fill in our get a free instant quote form.